Visitors with Father Chuck's Challenge walk down a road in the town of San Sebastian de Yali in Nicaragua and past homes built with donations to the charity named for Father Chuck Pfeffer, a deceased priest of the Archdiocese of Philadelphia. 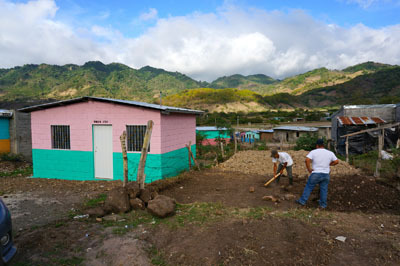 One of the new homes built through Father Chuck’s Challenge stands in a village in the highlands of Nicaragua, where workers prepare the site of another future home. The short letter in halting English tells the story. Thanks to Father Chuck’s Challenge, a Philadelphia-area ministry, chances are Ubeda’s dream will be realized. Father Charles (Chuck) Pfeffer, a Philadelphia priest whose ministry was mostly among youth and young adults with the archdiocesan Office for Youth and Young Adults and the Newman Apostolate, died way too young — at the age of 52 in 2004. His memory lives on in ways he never could have imagined, especially through Father Chuck’s Challenge, an outreach program begun in 2007 by Msgr. Francis X. Schmidt, a predecessor and mentor at OYYA. 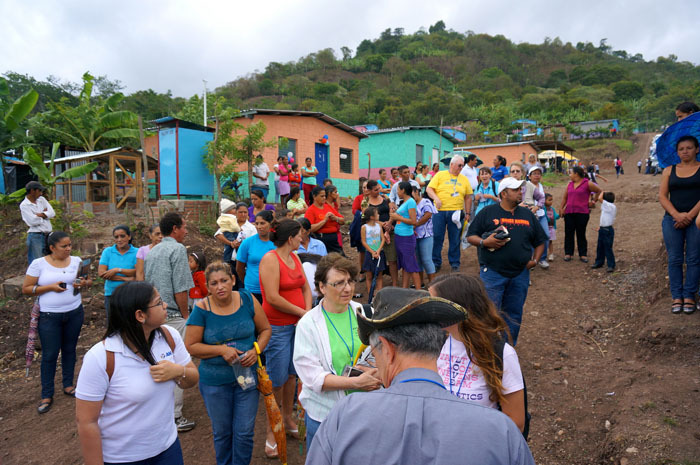 Working mostly in the highlands of Nicaragua and a bit in Haiti, in less than seven years 830 homes, 13 community centers, two medical clinics and four school houses have been built, thanks to the indefatigable fundraising done by Msgr. Schmidt and his loyal band of followers. That takes care of the corporal works of mercy, but the spiritual works of mercy haven’t been forgotten. Three chapels have been built, three more renovated and two rectories have been built. 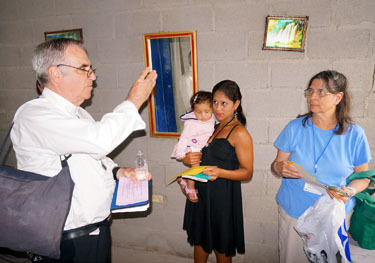 Father Charles Kennedy, an archdiocesan priest who joined the group from Father Chuck’s Challenge and its partner Food For the Poor that toured Nicaragua last month, blesses the newly built home of a young Nicaraguan mother and her daughter. A small group of pilgrims representing the donors led by Father Charles Kennedy, who has been working with Msgr. Schmidt, visited Nicaragua in June to see first-hand the progress that had been made. Older sites were revisited, and houses and other facilities were blessed by Father Kennedy and group members. “The people were very open and friendly; when we visited the chapels they participated in the Mass,” remarked Father Kennedy, who with years of experience in Hispanic ministry speaks fluent Spanish. “I learned things and there is still a lot to learn,” he said. Especially remarkable to him was the cleanliness of the houses and the people. “They have no electricity for washing clothing yet everything was so clean,” he remarked. Father Chuck’s Challenge raises the money that is passed on to Florida-based Food For the Poor, which along with other agencies, especially the American Nicaragua Foundation, actually oversees the construction of the houses that are deeded free and clear to needy families. The houses, which measure between 360 and 400 square feet, might cost about $3,200 including the luxury of a private outhouse. What kind of house do you get for $3,200? They are beyond basic by American standards. But this is Nicaragua, where a good part of the rural population lives in shacks built of lumber scraps and tarps with a dirt floor. 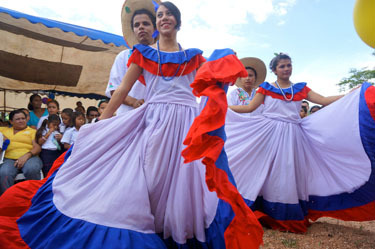 Young people entertained their American visitors with a traditional dance in their village. The new houses are concrete, either blocks or pre-cast walls sectioned off into about three rooms with a concrete floor and sturdy metal roof. They are provided with running water, and if service is available, very basic electricity. For good measure, basic furniture is included and often as not chickens, fruit trees and even goats. Mike McCarthy of St. Ann Parish in Phoenixville, who went along with his brother Joe, was impressed to see how the villagers had taken ownership of their new community, planting flowers and adding little personal touches. A community center built for the village had been changed into a school, for which the people thought was the greater need. “One woman told me she never dreamed in a million years she would have a house of her own,” McCarthy said. 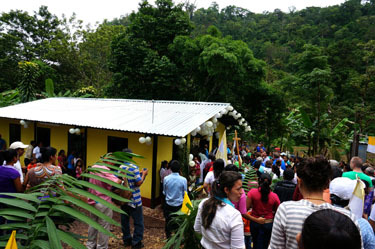 The contingent from America joined with residents of Piedra Luna, Nicaragua, to bless and dedicate a new community center for the village, built through Father Chuck’s Challenge. The names of the villages erected reflect donor parish names or patron saints of donors – San Augustin, San Patricio, Corpus Christi, Santa Maria Goretti, Santa Teresita, San Francesco Javier and of course Father Pfeffer’s Village. Deacon Peter Niche of St. Maria Goretti Parish in Hatfield was especially interested in revisiting St. Maria Goretti Village, where 75 homes and a community center were built. For Kathy Statton of St. Philip and James Parish in Exton, this was the first time she traveled to the region and it was a culture shock because pictures viewed ahead of the trip just do not do justice to the poverty that is prevalent. Nonetheless, “It was a good experience to see it,” she said. 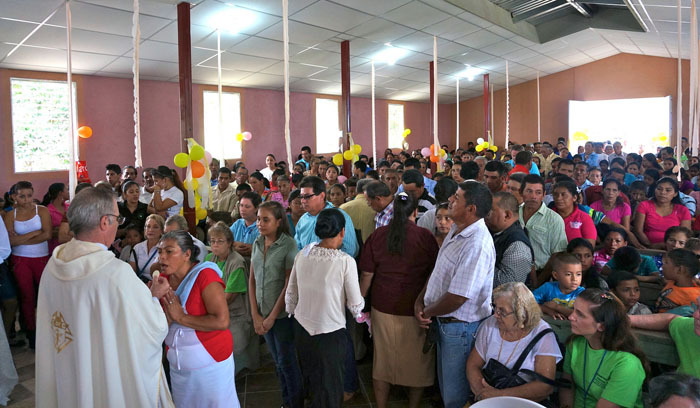 Father Charles Kennedy distributes holy Communion during Mass to worshipers in a packed church in the town of Wale, Nicaragua. Great priest and a great tribute in his memory.